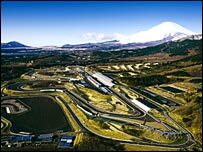 The Japanese Formula One Grand Prix will switch to the Toyota-owned Fuji Speedway from Suzuka in 2007. Suzuka, owned by rival Japanese car manufacturer Honda, has hosted the race since 1987. Fuji was upgraded in 2005 and holds a F1 licence. "Fuji Speedway will be the new home of Japanese F1 Grand Prix," confirmed F1 supremo Bernie Ecclestone. Built in 1966, Fuji hosted the first Japanese GP in 1976, when James Hunt took third to seal the drivers' title. Hunt won the second race in 1977 but the day was marred by a crash which killed two people at trackside and there was no Japanese GP for the next 10 years. Japan hosted two races in the 1994 and 1995 seasons, with the remote Aida circuit the venue of a second race run under the title Pacific Grand Prix. Suzuka, renowned as one of the greatest tracks in the world, may yet host a Grand Prix next year under a similar arrangement.